A neighborhood group that initiates, facilitates, and supports a variety of opportunities for citizens to become involved in positive community action – now focusing on Dictionary Day. Volunteering For Oakland (VFO) is a 501(c)3 non-profit community action group that fosters citizen involvement in our community. Our goal is to encourage Oaklanders to get involved in meaningful projects to make our city even better than it is. Volunteering For Oakland (VFO) is now focused on our Dictionary Day project. 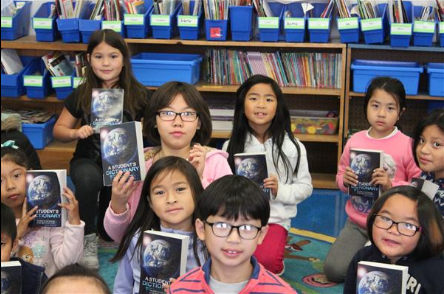 In 2017-18 school year, Dictionary Day provided dictionaries to thirty-six of the fifty-four Oakland Unified School District (OUSD) elementary schools – a total of 95 third grade classes and 2,328 students. We welcome regular or occasional volunteers to assist with classroom visits during the school year. If interested, please contact AdeleG@volforoak.org. Third grade is the target year for growing literacy. Literacy encompasses more than just words, language and usage. The Student’s Dictionary/Gazetteer we give to Oakland third graders is a general Reference Book that enhances literacy in the broader sense, with over one hundred fifty pages of supplemental information. Key features include the Constitution of the United States, the Declaration of Independence, brief biographies of all U. S. Presidents, World Maps, the Multiplication Table, information about the Continents, all 50 States, Countries of the World, and the Planets in our Solar System. See What We Do for more information on Dictionary Day, including testimonials. Please consider a modest donation to allow us to expand our existing programs and implement new ones. Click here to donate.